Lock in a great price for Eichardt's Private Hotel – rated 9.3 by recent guests! Beautiful historic hotel, centrally located to all activities in Queenstown. The hotel staff was friendly and helpful in every way. Perfect for solo travelers. Would stay there again. Everything about your hotel is excellent my husband and I said to one another you couldn't get better anywhere in the world. We had a wonderful time, thank you. Fantastic location and super luxe. Great food in the bar and restaurant. Amazingly friendly staff. We'll be back! Everything is great.I wish I could stay in main building next time. Superb experience! Extremely friendly and helpful staff. Hotel facilities and experience were outstanding. The location is great. It is right in front of the lake. The staff have been nice and helpful in arranging transportation and meals. The apartment is spacious and clean. I would definitely reccommend this hotel to friends! Lovely accommodation in a location that's second to none. Eichardt's Private Hotel This rating is a reflection of how the property compares to the industry standard when it comes to price, facilities and services available. It's based on a self-evaluation by the property. Use this rating to help choose your stay! Just 5 minutes' walk from the waters of Lake Wakatipu, Eichardt's Private Hotel offers accommodations with a fireplace, free Wi-Fi and satellite TV. Guests enjoy a restaurant and a bar. Some accommodations offer a balcony with mountain or lake views. All accommodations features a sofa, dining area and tea/coffee making facilities. Each offers a bathroom with a bath and shower. Eichardt's Hotel Queenstown is 5 mi from Queenstown Airport. 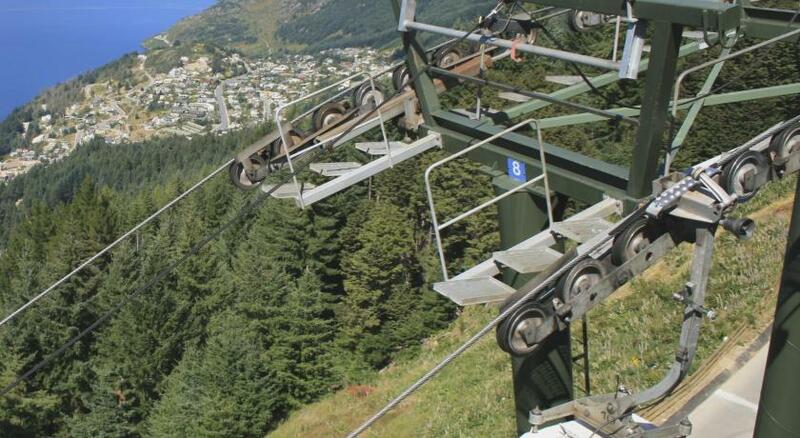 It is a 20-minute drive from the hotel to The Hills Golf Course and the Coronet Peak Ski Fields. Guests can dine by the fireplace at Eichardt’s Restaurant and Bar. The menu offers premium cocktails and meals using fresh local produce. The tour desk can book bungee jumping, kayaking and wine tours. In-house spa treatments are available. This property also has one of the top-rated locations in Queenstown! Guests are happier about it compared to other properties in the area. When would you like to stay at Eichardt's Private Hotel? This apartment is located 246 feet from the lakefront apartments. It features stunning views of the lake, nearby mountain ranges, and town center. It offers a full kitchenette, washing machine, clothes dryer, WiFi access, TVs in the bedroom and lounge. It has a gas fireplace, balcony with panoramic lake views. There is a king size bed, bathrooms with double sinks and a spa bath. Some apartments are located on the ground floor. This suite features a private balcony offering views over Queenstown Mall to the mountain ranges. The lounge area features a fireplace, a sofa and an LCD TV with satellite channels. The bedroom features quality bed linen and an Oppossum-fur throw rug. The bathroom offers a separate bathtub, a shower and heated marble floors. Also includes a dressing area with a deluxe mini-bar. This suite offers views over Lake Wakatipu and the surrounding mountain ranges. The lounge area features a fireplace, a sofa and an LCD TV with satellite channels. The bedroom features quality bed linen and an Oppossum-fur throw rug. The bathroom offers a separate bathtub, a shower and heated marble floors. Also includes a dressing area with a deluxe mini-bar. Balcony rooms are available for this room type upon request, and are subject to availability. This special offer includes one round of golf at Millbrook Golf Course, Queenstown. This apartment features a 2-person spa bath, a fireplace and a balcony offering views of Lake Wakatipu. It offers a fully equipped kitchen, laundry facilities and a lounge area with a flat-screen TV with cable channels. The luxurious bathroom has a shower, under floor heating and free toiletries. This Junior Suite features skylights, a separate lounge area with leather couches and a private office. It offers a marble bathroom with a double shower and a fur throw on the bed. House Rules Eichardt's Private Hotel takes special requests – add in the next step! All children under 2 years are charged NZD 50 per person per night in a crib. All older children or adults are charged NZD 260 per person per night for extra beds. Eichardt&#39;s Private Hotel accepts these cards and reserves the right to temporarily hold an amount prior to arrival. Eichardt's Private Hotel accepts these cards and reserves the right to temporarily hold an amount prior to arrival. If you expect to arrive outside reception opening hours, please inform Eichardt Private Hotel in advance, using the contact details found on the booking confirmation. Please inform Eichardt's Private Hotel of your expected arrival time in advance. You can use the Special Requests box when booking, or contact the property directly using the contact details in your confirmation. Felt understaffed. Housekeeping very uneven. Private pre dinner drinks area not cleaned up. Air conditioning not working properly. Noisy street sound from late night revellers. Expensive. A live band playing right under my suite until after midnight one night. Nothing offered in the way of recompense except a sorry. Small breakfast room that could sometimes not have enough tables for guests and they were still allowing casual diners for breakfast. Poor coffee - no one seemed to know how to make a flat white. Limited breakfast menu and leathery bacon. I also had to ask to have my room made up after 3.00pm one afternoon after I had been out for a couple of hours. Beautiful decor and presentation. Great location and helpful receptionist. The cost of airport pick up was extremely high. $120 for pick from the airport and another $120 to be taken to the airport. Total $240. We were picked up at HongKong airport by a Rolls Royce and that was half these prices. This was a great pity, as everything else about Eichatdt's was excellent. There was nothing we could say that we DIDN'T like about our stay st Eichardt. Staff were very hit and miss. Some exceptional, some very average.